An should be used before nouns that talk about one person or thing, and begin with a vowel sound (a, e, i, o, u). 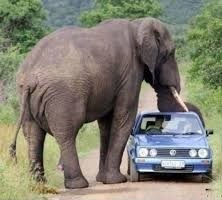 An elephant is next to my car. • Do you want an apple or a banana? Pronunciation is important not spelling. • She is an hour late. Remember: Pronunciation is important not spelling. Write a or an in each space. (win-dow) no vowel sound so a . (eh-gin-ear) vowel sound so an . (jer-na-list) no vowel sound so a . (hor-s) no vowel sound so a . (air-port) vowel sound so an . (you-na-ver-sity) no vowel sound so a . (our) vowel sound so an . (o-range) vowel sound so an . (how-s) no vowel sound so a . (op-era) vowel sound so an . Note: when we put an adjective before the noun the pronunciation of the adjective is important NOT the pronunciation of the noun. (a-pel) vowel sound so an . (reh-d) no vowel sound so a . (pro-blem) no vowel sound so a. (eh-co-nom-ic) vowel sound so an . (lan-gweh-g) no vowel sound so a . (for-ren) no vowel sound so a . (dee-sih-shun) no vowel sound so a. (un-ree-son-able) vowel sound so an. (tree) no vowel sound so a . (oh-k) vowel sound so an . (or-gan-eye-say-shon) vowel sound so an . (goo-d) no vowel sound so a . (tee-vee) no vowel sound so a .